The aim of this study was to compare a theoretical neural net model with MEG data from epileptic patients and normal individuals. Our experimental study population included 10 epilepsy sufferers and 10 healthy subjects. The recordings were obtained with a one-channel biomagnetometer SQUID in a magnetically shielded room. Using the method of x2-fitting it was found that the MEG amplitudes in epileptic patients and normal subjects had Poisson and Gauss distributions respectively. The Poisson connectivity derived from the theoretical neural model represents the state of epilepsy, whereas the Gauss connectivity represents normal behavior. The MEG data obtained from epileptic areas had higher amplitudes than the MEG from normal regions and were comparable with the theoretical magnetic fields from Poisson and Gauss distributions. Furthermore, the magnetic field derived from the theoretical model had amplitudes in the same order as the recorded MEG from the 20 participants. The approximation of the theoretical neural net model with real MEG data provides information about the structure of the brain function in epileptic and normal states encouraging further studies to be conducted. Epilepsy is a disorder involving recurrent unprovoked seizures: episodes of abnormally synchronized and high-frequency firing of neurons in the brain that result in abnormal behaviors or experiences. This is a fairly common disorder, affecting close to 1% of the population. The lifetime risk of having a seizure is even higher, with estimates ranging from 10 to 15% of the population. Epilepsy can be caused by genetic, structural, metabolic or other abnormalities. Epileptic disorders can be generalized, partial (focal) or undetermined. A primary generalized seizure starts as a disturbance in both hemispheres synchronously, without evidence of a localized onset. Partial forms of epilepsy start in a focal area of the brain and may remain localized without alteration of consciousness. MEG is a noninvasive imaging technique, applicable to the human brain with temporal resolution approximately ~1 ms . Several authors during the last decade have demonstrated the importance of MEG in the investigation of normal and pathological brain conditions [2, 3]. The major advantage of MEG over electroencephalography (EEG) is that MEG has higher localization accuracy. This is because the different structures of the head (brain, liquor cerebrospinalis, skull and scalp) influence the magnetic fields less than the volume current flow that causes the EEG. Also, MEG is reference free, so that the localization of sources with a given precision is easier for MEG than it is for EEG . The goal of this study is to compare the theoretical model that follows Poisson or Gauss distributed connectivity [5–12] with experimental MEG data from epileptic patients and healthy volunteers. Neural nets are assumed to be constructed of discrete sets of randomly interconnected neurons of similar structure and function. The neural connections are set up by means of chemical markers carried by the individual cells. Thus, the neural population of the net is treated as a set of subpopulations of neurons, each of them characterized by a specific chemical marker. We attribute the appropriate Poisson or Gauss distribution law to each subsystem to describe connectivity. The elementary unit, the neuron, is bistable. It can be either in the resting or in an active (firing) state. The transition from the resting to the firing state occurs when the sum of postsynaptic potentials (PSPs) arriving at the cell exceeds the firing threshold θ of the neuron. PSPs may be excitatory (EPSPs) or inhibitory (IPSPs), shifting the membrane potential closer to or further away from θ, respectively. Each neuron may carry an electrical potential of a few millivolts, which it passes on to the neurons to which it is connected. In this model, a net with N markers is assumed to be constructed of A formal neurons. A fraction h (0<h<l) of these are inhibitory with all the axon branches generating IPSPs, while the rest are excitatory with all their axon branches generating EPSPs. Each neuron receives, on average, μ+ EPSPs and μ- IPSPs. The size of the PSP produced by an excitatory (inhibitory) unit is K+ (K-). 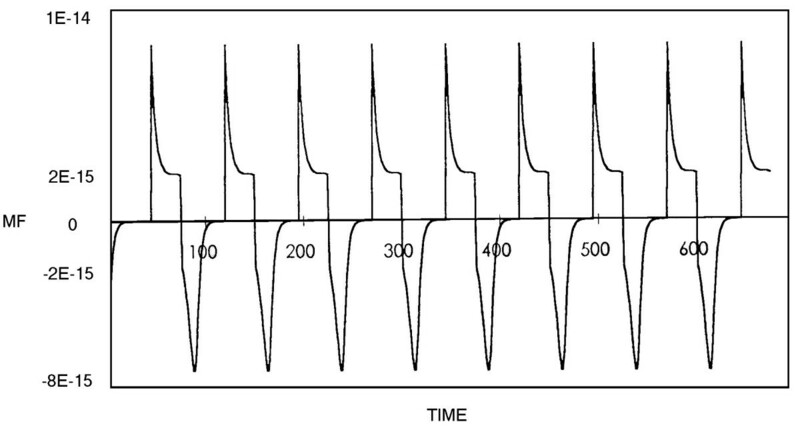 The neurons are also characterized by the absolute refractory period and the synaptic delay τ. If a neuron fires at time t, it produces the appropriate PSP after a fixed time interval τ, the synaptic delay. PSPs arriving at a neuron are summed instantly, and if this sum is greater or equal to θ, then the neuron will fire immediately, otherwise it will be idle. PSPs (if below θ) will persist with or without decrement for a period called the summation time, which is assumed to be less than the synaptic delay. 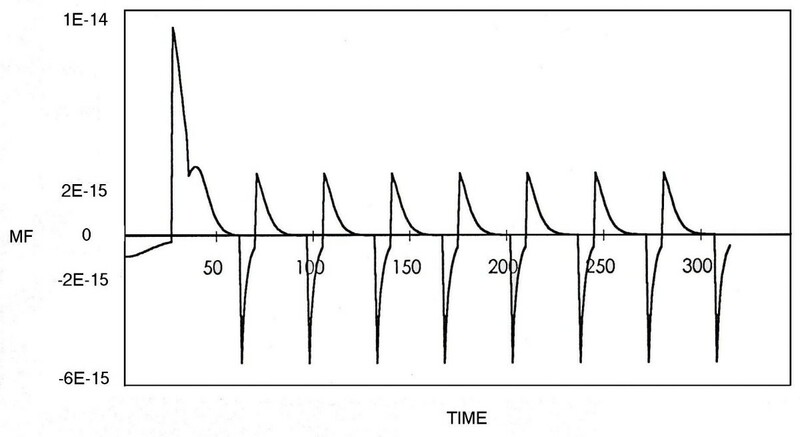 Firing is momentary and causes the neuron to be insensitive to further stimulation for a time interval called the (absolute) refractory period [5–12]. The mathematical formalism of this study is based on the equations for the expectation values of the activity derived in previous papers [5–12]. A brief mathematical analysis for each case is given below. PI = exp (-αn (1-h) μ+) (αn (1-h) μ+)l/l! where lmax and mmax are given by equation (4). Pl = exp (-αn μa+ (1-ha) ma) (-αn μa+ (1-ha) ma)l/l! Qi = exp (-αn μa- ha ma) (-αn μa- ha ma)i/i! P'l' = exp (-αn μb+ (1-hb) (1-ma)) (-αn μb+ (1-hb) (1-ma))l'/l'! Equation (16) in conjunction with equation (1) gives values for <αn+1> at t = (n+1)τ.
where μo and εo are the magnetic permeability and dielectric constant of the medium respectively. where the neural activity αn+1 refers to a Poisson or Gauss distribution of connectivities as given in the previous section. We compared the theoretical results with the experimental findings obtained using MEG measurements from 10 epileptic patients and 10 healthy volunteers. Informed consent for the methodology and the aim of the study was obtained from all participants prior to the procedure. Biomagnetic measurements were performed using a second order gradiometer SQUID (Model 601, Biomagnetic Technologies Inc.), which was located in a magnetically shielded room with low magnetic noise. The MEG recordings were performed after positioning the SQUID sensor 3 mm above the scalp of each patient using a reference system. This system is based on the International 10–20 Electrode Placement System  and uses any one of the standard EEG recording positions as its origin; in this study we used the P3, P4, T3, T4, F3, and F4 recording positions [14–16]. Around the origin (T3 or T4 for temporal lobes) a rectangular 32-point matrix was used (4 rows × 8 columns, equidistantly spaced in a 4.5 cm × 10.5 cm rectangle) for positioning of the SQUID [14–16]. The MEG was recorded from each temporal lobe at each of the 32 matrix points of the scalp for 32 s and was band-pass filtered with cut-off frequencies of 0.1 and 60 Hz. The MEG recordings were digitized using a 12 bit precision analog-to-digital converter with a sampling frequency of 256 Hz, and were stored in a PC peripheral memory for off-line Fourier statistical analysis. The method, by its nature (i.e. temporal and spatial averaging), eliminates short-term abnormal artifacts in any cortical area, while it retains long-lasting localized activation phenomena. We used the x2 – fitting method to analyze the MEG data . In our case n = 7 and the critical value for distinguishing the Poisson from the Gauss distribution was 14.1 (xcr2 = 14.1). If the estimated value of the x2 was greater than 14.1, the distribution was Poisson; otherwise it was Gauss. Using the x2-fitting method it was found that the MEG recordings from epileptic patients had Poisson distributions whereas those from normal subjects had Gauss distributions. The Poisson connectivity derived from the theoretical model represents the state of epilepsy, whereas the Gauss connectivity represents normal behavior. The magnetic field derived from the theoretical model was approximately in the same order as the recorded MEG in both conditions. Furthermore, the MEG data obtained from epileptic areas had higher amplitudes than those from normal regions and were comparable with the theoretical magnetic fields from Poisson and Gauss distributions. 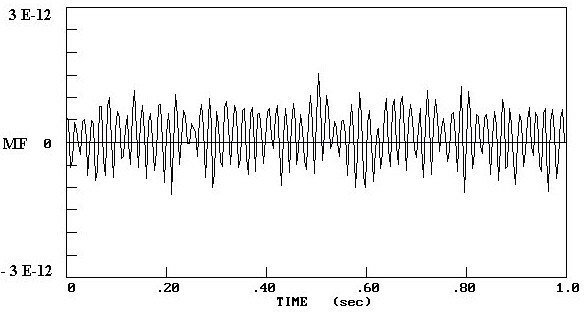 Figure 1 shows the MEG recorded from an epileptic patient; figure 2 illustrates the MEG recorded from a healthy volunteer. The MEG recorded from an epileptic patient over an interval of 1 s duration. The x-axis represents the time sequence and the y-axis the magnetic field. The MEG recorded from a healthy subject over an interval of 1 s duration. 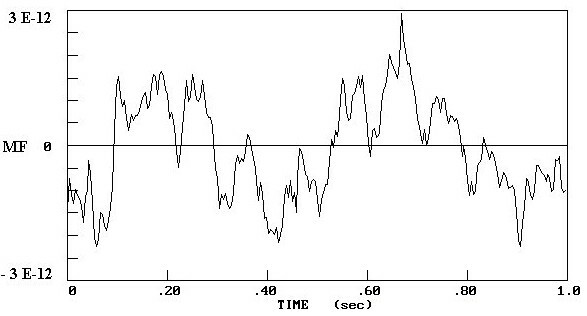 The x-axis represents the time sequence and the y-axis the magnetic field. Figures 3 and 4 show the magnetic fields derived from the theoretical model with Poisson and Gauss distributions respectively. The magnetic field derived from the theoretical model with Poisson distribution. The x-axis represents the time sequence and the y-axis the magnetic field. Parameters: ma = 0.6, θa = 5, = 15, ha = 0; mb = 0.2, θb = 4, = 192, hb = 0.01; mc = 0.1, θc = 3, = 34, hc = 0.01; md = 0.1, θd = 3, = 32, hd = 0; K± = 1. The magnetic field derived from the theoretical model with Gauss distribution. The x-axis represents the time sequence and the y-axis the magnetic field. Parameters: ma = 0.7, θa = 6, = 14, ha = 0; mb = 0.08, θb = 4, = 240, hb = 0.02; mc = 0.02, θc = 4, = 400, hc = 0.0; md = 0.1, θd = 4, = 337, hd = 0; me = 0.1, θe = 4, = 294, he = 0.03; K± = 1. Over the past three decades, neural nets have been intensively studied from several points of view. An area of considerable importance is that of biological nets, i.e. models of nets designed to imitate the structures and functions of human and other living brains and thus enhance our understanding of learning, memory, understanding etc. Widely used models include the pioneering work of McCulloch and Pitts , which treats assemblies of neurons as logical decision elements, the mathematical formalism of Caianiello  using the "neuronic equation", and probabilistic neural structures [5, 6] that monitor the net activity, i.e. the fraction of neurons that become active per unit time. All these models have had a measure of success in improving our understanding of functions such as those mentioned above. The effect of structure on function and dynamic behavior in neural nets has been also a subject of considerable interest in recent years. In the so-called probabilistic nets we have an assembly comprising a large number of neurons, randomly positioned in space, that have only partial connectivity; i.e. each neuron is connected to only a very small fraction of the total number of neurons in the system, randomly chosen. The principal idea is that this connectivity is given by the binomial distribution. In earlier work, probabilistic neural nets were investigated using Poisson or Gauss distributions of interneuronal connectivity; the main conclusion was that when a neuron was connected to a relatively small number of units, a Poisson distribution law was appropriate but if it was connected to a large number of units then a Gaussian law was a fairly good approximation [10–12]. Thus, Poisson neuronal nets may be viewed as approximately Gaussian whenever the number of synaptic connections is relative large. In this study we measured the MEG of epileptic patients and normal subjects in order to compare the theoretical neural net model [10–12] with real data. Analyzing the MEG data by x2-fitting revealed that the MEG recordings from epileptic areas had Poisson distributions . This finding is consistent with the correspondence between Poisson distributions and low numbers of internal neural connections, and with the synchronization of neural activity during an epileptic seizure [20, 21]. Moreover, the MEG recordings from epileptic areas showed higher amplitudes than those from normal regions, comparable with the results from the theoretical neural model with Poisson and Gauss distributions respectively (Figs. 1, 2, 3, 4). If a nerve cell is characterized by a given firing threshold which, when exceeded, results in spike discharge, two anatomical situations can be contrasted: one in which only a few synaptic contacts reach the cell in question, and a second in which the cell receives a large number of synaptic inputs. Suppose, in either case, that firing is dependent on the simultaneous excitation of a certain percentage of the total synaptic input (assuming that the ratio of excitatory and inhibitory synapses is the same in both situations so that the inhibitory inputs may be disregarded for the moment). Then it is clear that firing in neurons with a large number of synaptic inputs would require the synchronized activation of a substantial number of synapses; whereas in neurons with few synapses, firing may ensue even from a single excitatory synapse. Thus, a system in which neurons receive small numbers of synaptic connections is likely to exhibit a less "controlled" pattern of activity – and also "spontaneous" discharges . The inverse problem in MEG measurements is the search for unknown sources by analysis of the measured field data. To handle this task one must first study the forward problem, i.e. how the magnetic field and the electrical potential arise from a known source. For practical purposes one also has to choose appropriate models for the source and the biological object as a conductor. Sarvas  described basic mathematical and physical concepts relevant to the forward and inverse problems and discussed some new approaches. Especially, he described the forward problem for both homogenous and inhomogenous media. He referred to the Geselowitz's formulae and presented a surface integral equation to handle a piecewise homogenous conductor and a horizontally layered medium. Furthermore, he discussed the non-uniqueness of the solution of the magnetic inverse problem and studied the difficulty caused by the contribution of the electric potential to the magnetic field outside the conductor. The Poisson distribution corresponds to epileptic areas and the Gauss distribution to normal regions. The approximation of the theoretical neural net model to real MEG data provides a mathematical approach to the structure of brain function and indicates the need for further studies. The subscript i is a marker label and indicates the properties of a subpopulation in the netlet characterized by the ith marker.